Alyogyne huegelii is member of the Malvaceae (Hibiscus) family and is a medium shrub reaching a height of about two metres with a similar spread. The attractive leaves are hairy, with three to five lobes and dull green in colour. 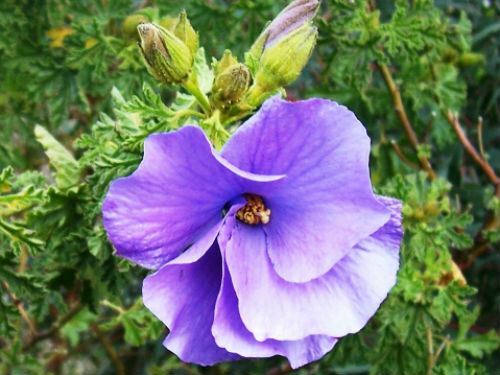 The flowers are large, deep purple and hibiscus-shaped. There are forms with white, yellow and pink flowers. A double-flowered form is also available. This is a cross between A. huegelii and A. hakeifolia (see profile). This hybrid appears to be less vigorous than A. huegelii. The main flowering period is from late spring to summer with sporadic blooming at other times. The flowers open in the morning and usually last one day. Even so shrubs are capable of producing hundreds of blooms per season. Foliage, on the lower limbs, tends to become a trifle sparse if left unpruned. After the main flowering flush in summer plants may be pruned back quite hard. A desirable characteristic is the shrub’s ability to send out vigorous, fast-growing shoots from old wood. This allows plants to be kept to small compact shrubs if required. Alyogyne huegelii occurs in southern Western Australia and the coast of South Australia. Propagation is rapid and satisfying from cuttings.